Well, that settles it – government surveillance without suspicion is a costly endeavor. The case surrounding the wrongful arrest of Phil Chinn – the Olympia activist targeted for surveillance based on his political associations – has come to a close. In an agreement that should strongly deter future government snooping, the Washington State Patrol, Grays Harbor County, and the City of Aberdeen agreed to pay a settlement of over $417,000, including attorney's fees, to end litigation. In May 2007, Phil Chinn planned to attend an anti-war demonstration in Aberdeen. Along the way, he met up with a few friends in Olympia in order to carpool to their destination. Undercover officers observed the group, and police issued an “attempt to locate” code directing officers to follow Chinn’s car, identified by its license plate number and described as carrying “three identified anarchists.” State Patrol officers then tailed Chinn’s car for some time, and pulled him over for “erratic braking” -- he had been slowing down where the speed limit drops. Police then wrongfully arrested Chinn on a trumped-up DUI charge, which was later dismissed after lab tests turned up negative. Chinn never made it to the demonstration. He later filed suit against the offending law enforcement agencies, asserting they had violated his constitutional rights. Chinn was represented by attorney Larry Hildes and the ACLU of Washington and its pro bono attorneys Nathan Alexander and Mark Carlson of Dorsey & Whitney LLP, and Evan Schwab. While we are happy that Chinn’s rights have been vindicated, the unfortunate truth is that this was not an isolated incident. Coordinated efforts to target political activists for surveillance exist not only in Washington, but throughout the country. Yesterday, the national ACLU released a report on political spying. Titled “Policing Free Speech: Police Surveillance and Obstruction of First Amendment-Protected Activity,” it describes instances of unwarranted spying in 33 states. It’s a harrowing account of governmental overreach that supports the need for new state and federal laws protecting free speech and privacy rights against suspicionless surveillance. 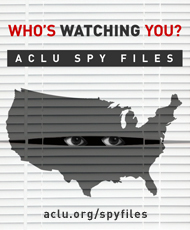 Along with the report, the ACLU announced the launch of its enhanced Spy Files website. Containing information about various facets of the modern surveillance state, including Fusion Centers and Suspicious Activity Reporting, the Spy Files site sheds light on the otherwise opaque bureaucracy of surveillance. No matter the state, no matter the issue, government should not spy on people without reasonable suspicion of criminal activity. By treating political activists like common criminals, these Big Brother abuses discourage active participation in our democracy. Further, such spying diverts valuable police resources from tackling crime and going after real threats to public safety. As the Chinn settlement demonstrates, excessive surveillance is a cost we can’t afford.